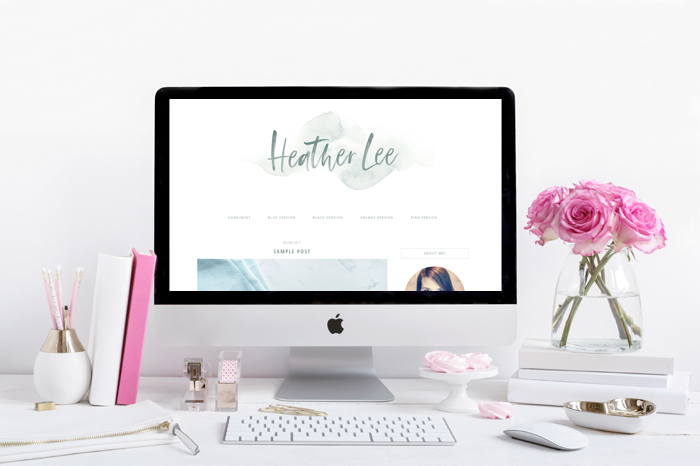 Heather is a functional WordPress blog theme, perfect for the blogger who wants their blog content to be the star of the show. One of our skilled designers will take care of your theme installation, including any requested color changes and logo implementation all within one weeks time so you don’t have to worry about a thing. We offer an amazing post-install support package that will provide you with basic troubleshooting help as you settle into your new design. See below for additional information about this theme. REQUIREMENT: You must have a self-hosted WordPress site in place to use this design. For step-by-step instructions on how to set up a self-hosted WordPress site, click here. Built so you can seamlessly install and use the popular WooCommerce plugin. Woocommerce is the perfect tool for selling physical or digital products. Includes mobile responsive coding, which means your design will fit every screen, from desktop to tablet to phone beautifully! Make sure to check it here. Add up to four social media buttons of your choice to your sidebar and top menu bar ($10 per additional button). Includes favicon shown in demo or you may provide us with a favicon (32 x 32px) that you’d like to be used. Includes a styled about me area that links to your about page. Your profile area will be set up by your designer but then can be easily edited by you in the future. An unlicensed copy of the Genesis Framework will be installed with your design. If you would like to be a licensed Genesis owner so you have access to Genesis framework support (highly recommended), you can purchase your own copy of the Genesis Framework here. Featuring post excerpts on the blog page will give your readers a taste of what each of your posts is about and will help increase your pageviews. A preview of your design will be created on a live test site so you can preview your design with all of your customizations in place before your designer installs the design. One of our skilled designers will take care of the installation of the design so all you have to do is start using it! For one-week post install, your designer will be happy to assist you with any basic troubleshooting questions you may have as you settle into your new design. We want to leave you feeling confident using your new design. IMPORTANT: Please click the buttons below to review our design process, terms of service, and to select additional blog accessories before purchasing.